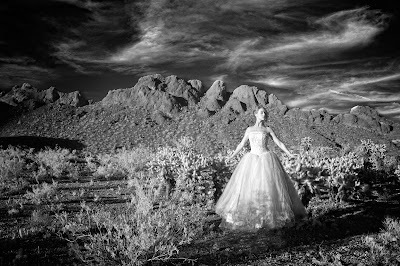 GUEST BLOG POST BY GARY POTTS ON INFRARED PHOTOGRAPHY! Please extend a warm welcome to my friend and fellow photographer, Gary Potts, of Indianapolis, Indiana. 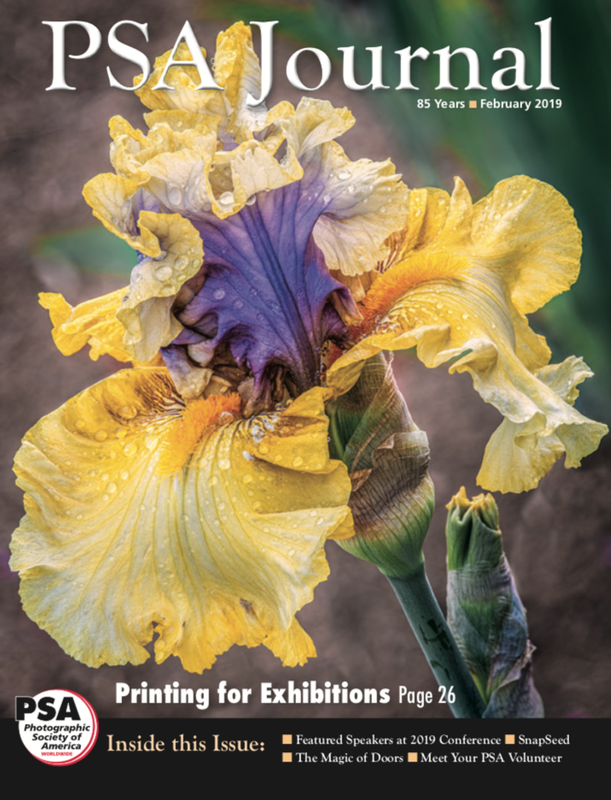 Gary and I are members of the Photography Society of America, and are involved with local organizations, including Photo Venture Camera Club, Indianapolis Professional Photographer's Guild, and Riviera Camera Club – all excellent organizations full of talented photographers! 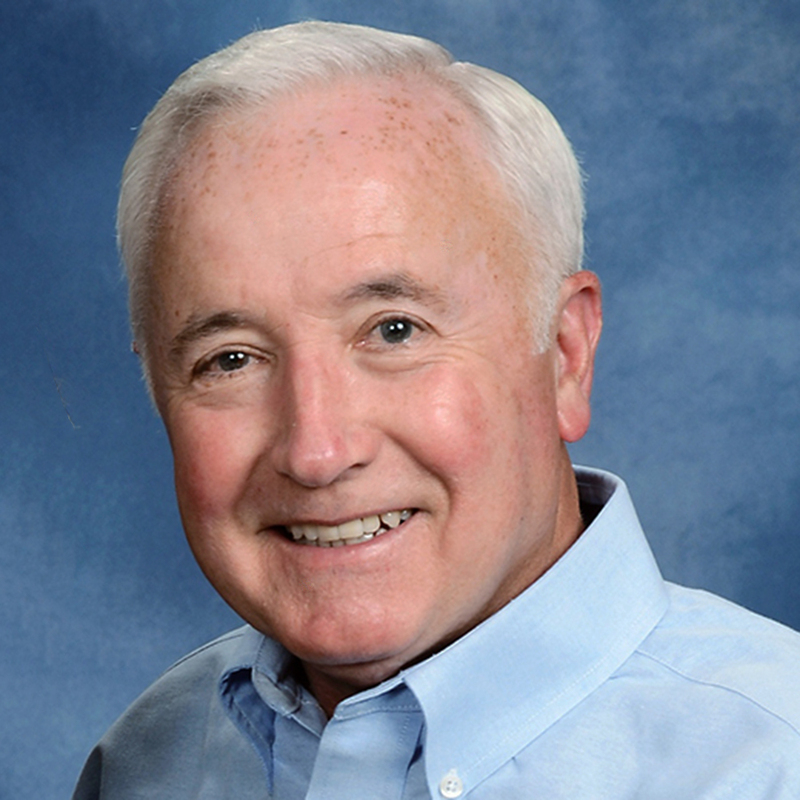 Recently Gary presented to local clubs on one of his passions, Infrared Photography. 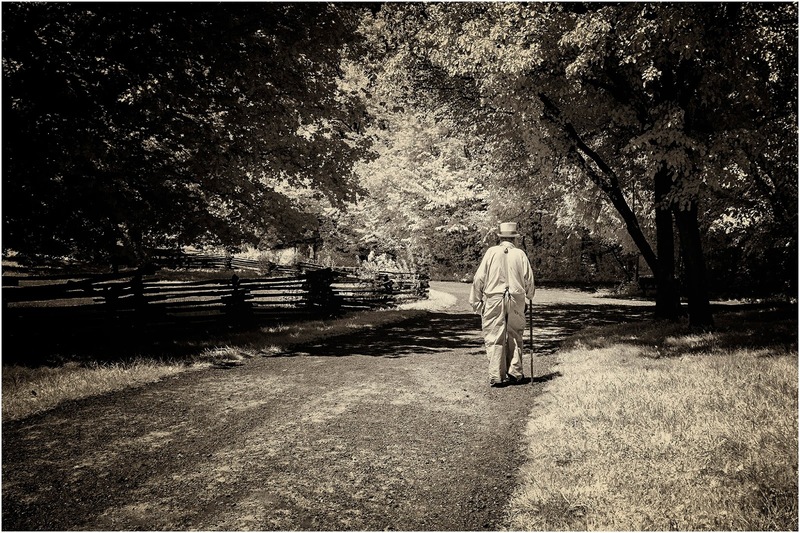 He did such a great job and shared so many inspiring images that I asked him to write a Guest Blog Post. Years ago, many of us who started a little earlier than others (Oops, maybe we’re just OLDER than others rather than starting earlier!) used this surreal film in a yellow box labeled Kodak Hi-Speed Infrared HIE 135-36. We needed to load it in the dark into our cameras, not touch the emulsion side more than necessary to get it wound onto the take-up spool of our SLR’s, and finally to develop it by unloading it in the dark or taking it to a lab that knew what they were doing. We had very little idea of what we’d see and what we’d get until that wonderful monochromatic proof sheet made its way back to us in a day or two. Oh, did I mention we had to put a deep red filter over our lenses during exposure and sometimes expose for shutter speeds that mandated a tripod? 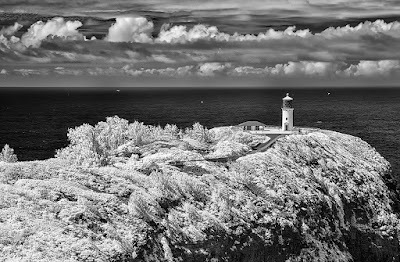 Those golden days are past us, and like so many aspects of photography, we have a new world in the digital age in regard to photographing in the infrared spectrum. It’s novel, exciting, a unique new view of our surroundings, and yet one more tool in the kit of those who want to create exciting images with impact. A recent image made on a trip to Kauai, Hawaii, “Kilauea Moment”, typifies how the ordinary might just be taken to the extraordinary by changing the medium from normal daylight to the world of infrared. Before going further, just what IS the infrared spectrum? We have heard it mentioned in regard to missile guidance systems, intruder cameras, and night vision goggles…but in photography? Well, quite simply, it refers to a portion of the light spectrum we typically can’t see. Light as we know it is measured by wavelengths, and the unit of measure used is the nanometer. Visible light is measured from 400 – 700 nanometers. Light at this ‘length’ can be seen with the naked eye. Just above that wavelength in the region of 700 – 900 nm we have infrared light or radiation that is invisible to us. However, remove the infrared blocking filter from the sensor surface of a digital camera, replace it with an infrared enhancing filter, and you have a camera that is capable of capturing images in the infrared spectrum. Enough of the Physics of Light101! How is this accomplished? While there are several businesses across the world that will ‘convert’ a camera from digital (visible light spectrum) to digital (infrared spectrum), the one seemingly most popular or more, pardon the pun, visible, is a firm called LifePixel Inc. Based in Mukilteo, WA, this business is focused primarily on infrared photography and all its components. 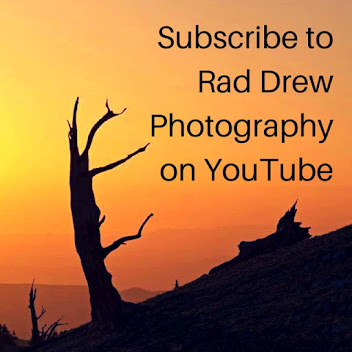 Not only can you pack and ship your camera to them for conversion, you can download and view numerous tutorials and helpful Q&A pages to reduce the complexity of digital infrared photography. 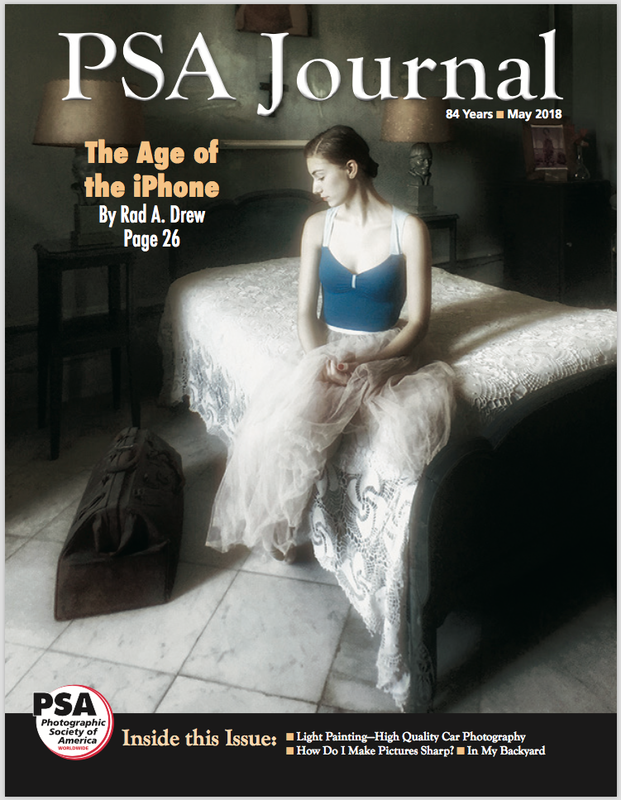 [Editor's note: If you choose to purchase from Life Pixel, mention the name of my friend, photographer, Tony Sweet. Dropping his name when you order could save you some money or get you preferred service (not that LP isn't good to every customer!). Another company that is new to me (brought to my attention by Tony Sweet) is Kolorivision out of Raritan, New Jersey. I've not used this company, but fellow photographers speak highly of it. There are two things that caught my attention with Kolorivision: One, their IR conversion process is "reversible," (like some vasectomies!). You can convert a camera's sensor and then have the sensor switched back for regular shooting if you should ever need to. Two, they configure neutral density filters for infrared cameras that work well. Tony Sweet uses them for long exposure IR photography to get those sweeping clouds or moving water that add to the drama of the image. If you decide to use Kolorivision, access via Tony Sweet's link (http://bit.ly/kolarivision_tonysweet) for a $10 discount . Another great company for having cameras converted is Spencer's Camera based in Alpine, Utah. I purchased an IR-converted LUMIX DMC LX7 point-and-shoot with 4x optical zoom from them and have enjoyed using it to make many IR images. Spencer's, too, has a host of educational information on their site and are more than happy to discuss IR or Full Spectrum camera conversion with you. So, you’ve converted a camera (at a current cost of about $375 +/-) to digital infrared, now what? But I’m getting ahead of myself, and a better question to ask at this point is “why should I shoot infrared?” The flip answer is “because you can”, but a more cogent answer is that digital infrared images offer you more variety, more latitude, and perhaps greater creativity in your pursuit of the winning image. 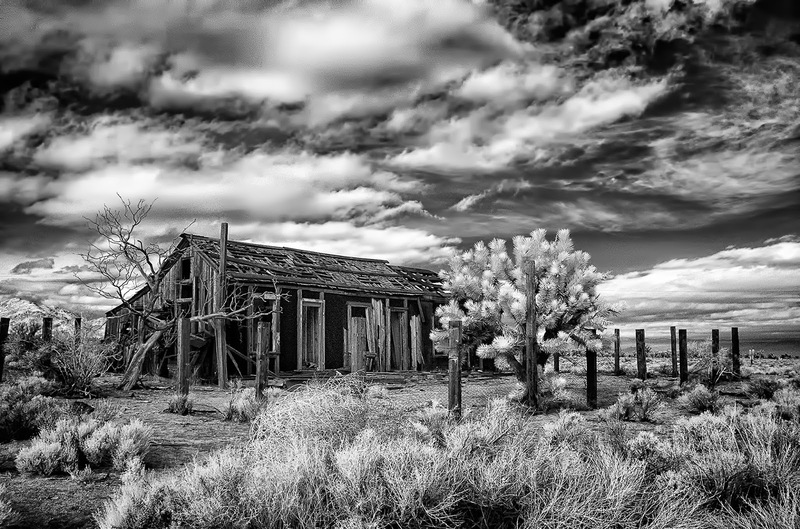 In general, images taken in deep black and white infrared display bold black and whites, darken the skies, and turn most all foliage to various shades of white. 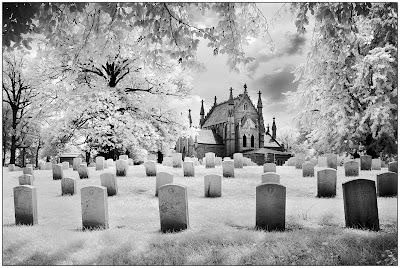 The ethereal effects of infrared are most pronounced in the image “Fallen Dreams”taken at Crown Hill Cemetery in Indianapolis, Indiana. Note the skies and equally view the grass and the foliage. 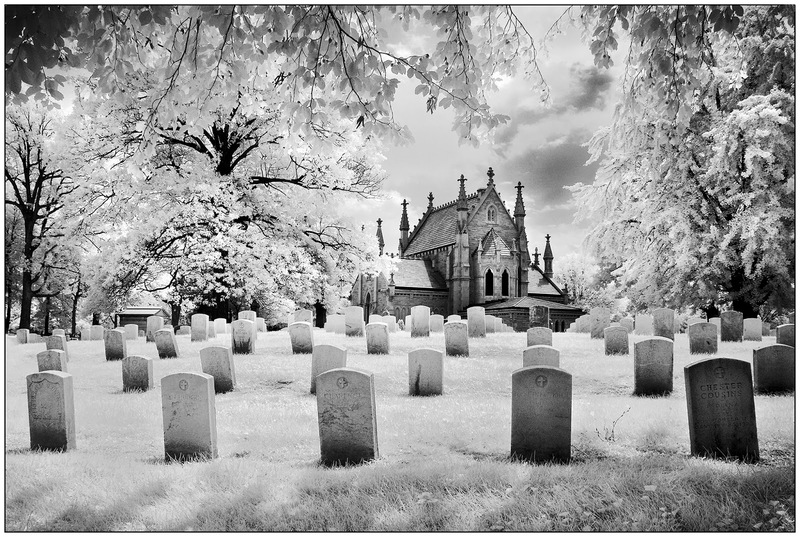 Inanimate objects like stone would typically render as normal monochromatic representations in infrared. There’s so much more to say about all this. What shutter speed and f-stop and ISO you ask? Start with a bright sunny day with an ISO of 200, a shutter speed of 1/60th second and shoot at f8 or f11. Your histogram, while not exactly accurate for measuring infrared light levels, gives a decent approximation of your exposure. Adjust your next shot from there. What about focus? Infrared light focuses at a different place in the film plane to daylight. Images can be blurry if you rely entirely on your camera’s AF feature or even focus manually. LifePixel solves that during conversion such that your converted DSLR will now be ‘tuned’ to auto-focus in the infrared spectrum. This takes away much of the guesswork or special lens settings from the film days. We could go further, but you have the idea, you have some new information, and you have at least one website from which to learn even more. Give it some thought, especially if you’re in the market for a new camera and are wondering if it’s worth it to put the old one on eBay or another similar online site. Your new images in INFRARED may be all you need to convince yourself you’ve added to your photo portfolio and have made a wise choice! 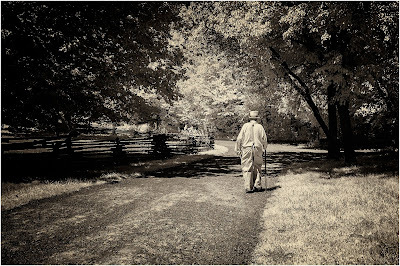 Thanks for reading everyone, and thanks, Gary Potts, for a great post! If you have any comments or questions, please email me here. I'll share any comments that are directed to Gary. 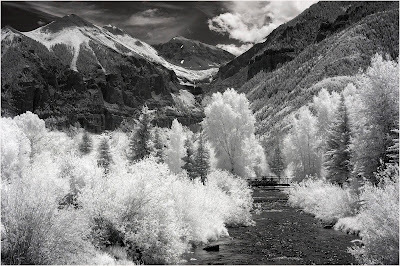 To see some of the IR images I've created with my LUMIX DMC LX7, visit my Infrared Gallery. 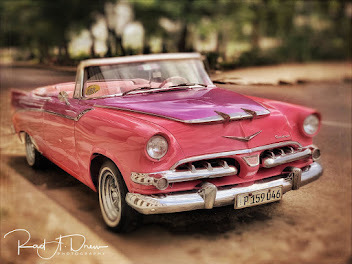 Also, I process my IR images using Topaz Studio and Topaz Labs plugins and adjustments, and I love the results! To see how I process IR images in Topaz, see my Topaz Webinar videos on YouTube. I usually process one IR Image per webinar. 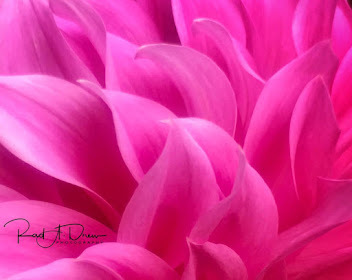 At long last, I've opened registration for my How I Did It!™ Mobile Photography Webinar Series! 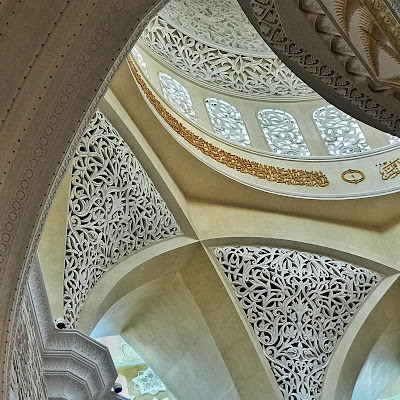 To provide a foundation for subsequent webinars in the series, Webinar 1 will delve into the nooks and crannies of SnapSeed, arguably the most widely used (and underutilized) of all mobile photography apps. Read on to learn more and to register! SnapSeed is one of the most widely used apps among mobile photographers and for good reason: It’s a virtual dark room in the palm of the hand. But are you getting the full benefit from this powerful app? Because of the breadth and depth of this comprehensive app, it’s possible that you are using only a fraction of SnapSeed’s potential. 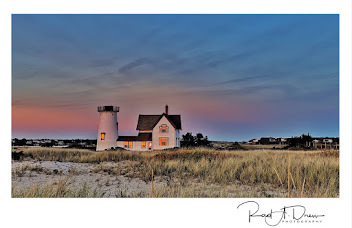 In this webinar, I'll take you on an exploration of the nooks and crannies of SnapSeed, revealing its hidden powers, and introducing you to new steps to include in your post-processing workflow. This list represents just the core learning objectives covered in this hour-long webinar. I'll demonstrate these and other features on actual images so you can see how the adjustments effect the image. Log-on information provided at time of registration. Due to the size of the group, questions cannot be answered during the webinar, but will be collected and I'll respond within 48 hours. Each webinar is recorded and archived and participants will have access to these recordings for repeated viewing.